During the year since our last convention, the growth of the National Federation of the Blind has continued at an accelerating pace. We have established new programs and begun the process of outlining new directions for our organization. Despite our plans for broadening our field of endeavor, we remain what we have always been--the blind organized for collective action. The organized blind movement takes its spirit and its fundamental faith in the ability of the blind from the experiences of tens of thousands of our blind members. Those willing to work, those with the capacity to believe in the innate ability of the blind, those committed to share one another's burdens--these are the members of the National Federation of the Blind--blind students, blind sheltered shop workers, parents of blind children and the children themselves, blind people who have not yet received the training they need, blind people who are seeking employment, blind professionals in the field of work with the blind, blind lawyers, blind teachers, blind factory workers, blind people employed with the government and in the private sector, and the sighted family members and friends of the blind. We are the blind, determined to build opportunity for ourselves and those who come after us. In 1999 we initiated a capital campaign to secure funding for the National Research and Training Institute for the Blind, a new building to be constructed at the National Center for the Blind. Braille literacy for blind students and adults is weak, and the unemployment rate for working-age blind people remains at 74 percent. The most effective programming for the blind has been organized, conducted, and led by the organized blind movement. We are justifiably proud of the accomplishments we have made, but we are far from finished. In our new research and training institute we intend to explore methods of training that integrate the techniques used in the best orientation centers with the expanding technologies that are being developed. Furthermore, if the technologies have not yet been created and the training methods have not yet been discovered, we will do the work ourselves. When I came to the convention in 1999, I said that the cost of the capital campaign would be eighteen million dollars. This is an extraordinary number. I said that we would find a way to raise the money, but I was aware that many people doubted, and sometimes I wondered myself how we would manage it. My current best estimate of the cost for the capital campaign is nineteen and a half million dollars. This is even higher than the astonishing price I stated in 1999. Although this is an increase from earlier, we want our institute to have in it all that is necessary for the best research and the best training programs that can be devised. We could cut back on our ambitious plans, but this is not advisable. For example, we are running the most up-to-date computer cable to every single office and conference room in the new facility, many miles of it. We are building the infrastructure for communication throughout the building and throughout the world by computer, by telephone, and by the next generation of communication devices. We do not yet know what these devices will be, but we will have the cable for them, the air conditioners to cool them, the electricity to run them, and whatever else we need to operate them. Eighteen million dollars is an ambitious number. Nineteen and a half million is more ambitious still. We have not completed the capital campaign, but we have done well. At the time of this convention we have raised in pledges, in actual gifts, and in promises $18,675,432.14. This means that we have less than $900,000 left to go, which is less than 5 percent of the total. Consider what I have said. Nine hundred thousand dollars is not an insignificant amount of money, but compared with what we have already raised, it is only a fraction of the total. This shows the commitment of our organization. This demonstrates that we can and will determine our own future. This illustrates the strength of the National Federation of the Blind. On October 19, 2001, we broke ground for the new institute. Several hundred Federationists attended the ceremony, and I took a shovel in my hand along with approximately fifty Federation leaders, public officials, and company executives to commence the excavation. My shovel struck an object in the ground, and I invited members of Congress to help me dig. We uncovered a model of the National Research and Training Institute for the Blind. When we had hoisted it to the platform we were using for the ceremony, we discovered that it contained artifacts from the future as we imagine it to be--documents from the training programs we intend to create, machines to provide access to information, devices to assist the blind in travel, and scholarly papers describing the innate normality and capacity of the blind. Later that evening several hundred of us gathered for a gala celebration. In addition to members of the Federation, public officials, and business executives, we were joined by members of the Baltimore Ravens football team. Blind people today do not play football effectively, but with new research and innovative training techniques, who can tell? Since the groundbreaking, progress has been steady in the construction of our new building. The structure consists of five levels: one below ground, one at ground level, and three more above ground level. The bottom two floors are for parking. The three floors above ground level are for office space, classrooms, a research library, computer laboratories, incubator space, an auditorium, and other meeting rooms. The required excavation has been completed; we removed 2,030 cubic yards of concrete, 1,200,000 pounds of brick and other miscellaneous material, and 15,654 cubic yards of soil requiring 1,505 trucks for its removal. We have poured the foundations, laid concrete on the below-ground level, and installed support columns and concrete for half of the ground level and half of the story above the ground level. To do this we have installed 200 tons of reinforcement steel and poured 2,140 yards of concrete weighing 4,280 tons. The completion date for the National Research and Training Institute for the Blind is estimated to be not later than the fall of 2003. By the time we come to the convention in 2004, the structure will be completed, furniture will be in place, equipment will be installed, and we will be developing the programs for this new facility. Already we have created a policy advisory board to assist in developing imaginative programming and the organizational structure for the institute. Ideas are being contemplated, and communication is occurring with universities to initiate partnerships for training classes and research efforts. The difference between our research institute and those established by others is that the blind will be involved at all levels and that the experience of blind people will be part of the research and training. We confidently expect that this participation by the blind will produce positive results. In 1958 Dr. Kenneth Jernigan became director of the Iowa Commission for the Blind. At the time he became director, programming for the blind in Iowa was estimated to be the poorest in the nation. Within a short time he established in Iowa an Orientation and Adjustment Center for the Blind based upon principles established within the National Federation of the Blind. That center soon became regarded as the best in the world, and it has served as a model for many others, including the Louisiana Center for the Blind, the Colorado Center for the Blind, and our orientation center in Minnesota, Blindness: Learning in New Dimensions. Dr. Jernigan ceased his directorship of the Iowa Commission for the Blind in 1978. When the inspiration and leadership of the National Federation of the Blind were no longer a part of the orientation center in Iowa, it ceased to have the effectiveness it had previously possessed. At the end of last summer Allen Harris, the treasurer of the National Federation of the Blind, who had been serving as second in command at the New York Commission for the Blind, became director of the agency for the blind in Iowa. For more than two decades, the emphasis in work with the blind in Iowa had been less than cutting edge, focusing more on what the administrators were against than on what they were trying to accomplish. This has now been altered. More than two decades of decline will not be reversed in a day, a month, or a year; but it will be reversed. With high hopes and hard work dreams of a productive future can be made real. In Iowa we have returned to the hard work and the high hopes. At our convention last year we heard from Erik Weihenmayer, the first blind person ever to climb Mount Everest. Following the convention, we invited members of Congress to participate in a congressional reception recognizing this outstanding accomplishment and featuring along with it other efforts of the National Federation of the Blind including our plan to establish a research and training institute. Many Senators and Congressmen attended the reception and learned about our work. Later that day a number of us were invited to the White House to visit with President Bush. Erik Weihenmayer, members of the Everest climbing team, my wife Patricia, and I spent half an hour in the Oval Office talking with the president about his hopes for America and the work of the National Federation of the Blind. Although the exploits achieved by the National Federation of the Blind Everest Expedition had originally attracted the president's attention, the focus of the conversation was on the spirit of the American people and the reality that the blind too share that spirit and want to make our contributions to our country. The president was personable, warm, and friendly; he made it plain that he cared about us. He cared especially about the spirit we represent--the spirit of the National Federation of the Blind. For more than twenty years we have been working jointly with the United States Department of Labor to assist blind people in getting jobs. Part of the problem consists in getting timely information about the jobs that are available. To address this problem, we have created America's Jobline�, a telephone service which provides access to all of the job listings on America's Job Bank. Although this system was devised to meet the needs of the blind, it soon became evident that it was equally usable by sighted job applicants. Last summer shortly after our 2001 convention, I was invited to give an address at the largest gathering of officials from state and federal programs regarding employment, the Joint Employment Training and Technology Conference (JETTCON). The segment of the program in which I appeared included three speakers: Doug Becker, the president of Sylvan Learning Systems, a five billion dollar company; Elaine Chao, secretary of the United States Department of Labor; and the president of the National Federation of the Blind. 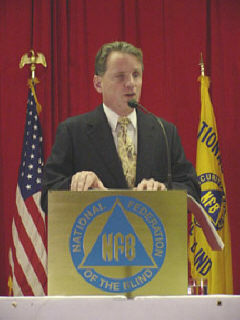 When I had concluded my portion of the program, Doug Becker remarked to the assembled audience that he thought my presentation was of such a nature that it put him at a disadvantage--he had clearly not expected it to be of the quality we have come to expect in the National Federation of the Blind. This year we are expanding the America's Jobline� service. Not only does it provide access to several hundred thousand job listings, but it also permits users to apply directly for employment while on the phone, filling out job applications using the touch-tone telephone. Once again our expansion of Jobline� is supported by the United States Department of Labor. This upgraded system will significantly increase the ability of job applicants to apply for work. This is one more example of the imagination and the technical expertise of the National Federation of the Blind. On March 1, 2002, we started the brand new NFB-NEWSLINE� service, a much upgraded and re-engineered version of NEWSLINE. Through NFB-NEWSLINE� we now provide fifty-three daily newspapers to blind people in the fifty United States, Washington, D.C., and Puerto Rico via touch-tone telephone. In the first four months of operation we have furnished eligible readers with approximately five million minutes of newspaper reading, making this one of the most popular and beneficial services now available to blind people anywhere in the world. Readership has increased by 40 percent within one year. Further developments are under consideration, but they can occur only if we all work together to secure the long-range support needed. Nothing like this has ever before been done, and it was accomplished by the imagination and the effort of the National Federation of the Blind. A long-time leader of the National Federation of the Blind is Joanne Wilson. She has served as a member of the Board of Directors, as president of our Louisiana affiliate, and as the founder and first director of the Louisiana Center for the Blind. Joanne Wilson's leadership and effectiveness have been recognized by the Bush administration. She was appointed by the president to serve as the commissioner of the Rehabilitation Services Administration. On April 15, 2002, Joanne Wilson received further recognition of her outstanding contributions to America. She was awarded a doctorate of Humane Letters honoris causa by Menlo College in California. In conjunction with the degree ceremony, the university conducted a symposium on the blind civil rights movement. Professors from the college, leaders from the National Federation of the Blind, and a vice president from the Microsoft Corporation participated in the symposium. Giving the keynote address at the gathering was our own Joanne Wilson. Development and promotion of technology that provides equal access to information for the blind is a high priority of the Federation. In 1990 we established the International Braille and Technology Center for the Blind, which is now incorporated in the Federation's technology department. Our commitment is that we will have in the International Braille and Technology Center for the Blind at least one of every device or computer program that provides information to the blind in Braille, in refreshable Braille, or in speech. During the past year we have acquired in this center seventeen electronic Braille notetakers, five different talking voting machines, seven distinct refreshable Braille displays, two devices for reading labels on medicine bottles, eight Pentium-class computers, one talking graphing calculator program, two separate communication systems for the deaf-blind, two machines for producing tactile drawings on Swell paper, ten different computer games configured so that they can be played by the blind and the sighted at the same time, two high-speed Braille embossers, two devices for displaying dynamic tactile images in real time, and two talking computer systems designed and configured specifically for use by the blind. In addition we have been continuing our work to promote nonvisual access. We have reviewed the Medicare System Web site to determine its accessibility to blind computer users. We have also provided feedback to Hewlett Packard regarding the accessibility of an unusual approach it is taking to permit blind computer users to interact with their printers. We have continued to work with both Microsoft and America Online (AOL) to assist in developing nonvisual access to their products. At times progress seems incredibly slow, but still it exists. Although accessibility to Windows XP, the new operating system from Microsoft, is not all that we could have wished, it has many accessibility features built into it, and more are being developed. Last fall AOL released its version 7.0 along with configuration files designed to improve performance with screen-access software. AOL is more accessible to the blind than it has been in the past, and we are encouraged by the strong commitment of the company to solve access problems. At this convention we are initiating a new program to stimulate development of accessible Web material. One of the first companies to focus on a systematic approach to establishing nonvisual access to information on the Web is SSB Technologies. This company recognizes that the end users of the products, the blind themselves, are best able to judge when accessibility has been achieved. They have asked that the National Federation of the Blind be prepared to offer our opinion about accessibility; they ask that we certify sites as accessible when this has been achieved. The president of SSB Technologies will be appearing on the program later during the convention. We have continued to maintain and upgrade our Web site. With almost four thousand pages of information available and with a range of topic material as broad as the aspirations of the blind, our Web site is the richest source of information about blindness that exists on the Internet. Within the last year we have received almost nine hundred thousand visits to our Web site from people within the United States and from 124 other countries. As valuable as this resource is, it must be expanded, and we are determined that it will be. The National Federation of the Blind continues its participation in the World Blind Union, the world organization composed of agencies for the blind and organizations of the blind. Mrs. Mary Ellen Jernigan and I are the delegates from the Federation to the world organization, and I am a member of the constitution committee. Representing the Federation and our region of the world, we traveled to Denmark to participate in meetings concerning the constitution. The World Blind Union has never developed a set of philosophical understandings which give it clear direction. However, it does provide a forum for interaction among representatives from different parts of the world, and it brings blind people together to talk about what we can jointly do to improve conditions for the blind. Consequently, it is important that we continue to participate in it. This spring I traveled with a number of other members of the National Federation of the Blind to Japan to examine programs dealing with blindness there, to interact with corporations devising new technology for the blind, and to talk with business leaders and government officials about the work of the National Federation of the Blind. I was introduced to a number of members of the Japanese Diet, the legislature of Japan, and I was asked to present a lecture to a gathering of several hundred business leaders, representatives from the press, members of the Japanese Diet, and executives from agencies and organizations dealing with the blind. Our hosts indicated that participation in the conference was by invitation only and that they felt cooperation with us in the United States would be of considerable benefit. One product they showed us is the Speechio, a reading machine that verbalizes text which has been printed in a two-dimensional array of tiny dots. The inventor of this device and one of the senior managers from the company that manufactures and distributes it will be on the program later during the convention. We have not finalized our arrangements, but we believe that the spirit of the Federation in the United States will join in partnership with the technical inventiveness of Japan to bring greater opportunity to the blind. The Federation has fought to ensure that textbooks are provided to blind students at the same time that they become available to others. At a press conference on Capitol Hill which took place on April 24, 2002, we appeared along with Senator Dodd and Congressman Petri to announce the introduction of the Instructional Materials Accessibility Act. This legislation, which is now moving through Congress, will require the school districts and publishers to make textbooks available to blind students at the same time that they are distributed to the sighted. The legislation was developed in cooperation with the Association of American Publishers, the entity representing the businesses that print the textbooks. On Friday, June 28, 2002, only a few days ago, a hearing on this bill occurred in the Senate at which I testified. We will work to ensure that this bill becomes law. At long last blind students in school will receive their books not weeks or months late but right on time and in a form they can read. New voting machine technology makes it possible for blind people to cast a secret ballot without assistance from the sighted. We have been seeking the inclusion of nonvisual access technology provisions in election reform legislation being considered by Congress. Provisions to assure nonvisual access to voting are prominently included in the major reform bills passed by the House and the Senate. This legislation is expected to be signed into law by the president before Congress adjourns this fall. The ballot is a fundamental element of democracy, and we have determined that the blind will participate as fully as anybody else. This is one more reason for the National Federation of the Blind. We have continued to assist blind people to protect their rights through the courts. Last year I spoke of Janet Mushington, who was in the midst of a discrimination suit with the Baltimore City Schools. She had been offered a teaching position by school district personnel until they learned that she travels with a guide dog. They told her that she could come to school to teach but that the dog could not come because its presence would violate the school's no-animals-allowed policy. Such a declaration is a violation of the law. However, school district personnel seemed completely unaware that nondiscrimination legislation regarding blindness exists. When Janet Mushington protested, they failed to change their ruling. We assisted with a complaint, and we were prepared to take the matter to court. However, with the prospect of standing before the judge, school district officials had a change of heart. The school district has agreed to post notices in every school indicating that blind teachers have rights under the Americans with Disabilities Act. Those doing the hiring must undergo training concerning the rights of people with disabilities in employment. Officials are required to designate a coordinator of disability issues in the schools, and they must pay Janet Mushington $55,000. Arland Stratton is a blind vendor living in Illinois. The Illinois Business Enterprise Program revoked his license to operate a vending facility and forced him out of the interstate highway location to which he had been assigned. These actions were taken in clear violation of the Randolph-Sheppard Act. The National Federation of the Blind and our merchants division, the National Association of Blind Merchants, represented him at a hearing, but he has been out of work for weeks with no income to support himself, his child, or his wife, who will soon be having a baby. Arland Stratton has a right to the protections guaranteed to blind vendors in the Randolph-Sheppard Act and guaranteed to U.S. citizens in the Constitution of the United States, and we will be with him to ensure that his rights are respected. We will be with him until his license is reinstated. We will be with him until he returns to the vending facility from which he was summarily dismissed. We will be with him until he recovers what the law prescribes. April Davis is a bright blind woman who graduated this spring from Northwestern University. She wants to be a lawyer, but before beginning law school, she believes that she needs training in the skills of blindness. She wants to receive this training from the Louisiana Center for the Blind, but the Illinois Office of Rehabilitation Services refused to provide the necessary funding; they wanted her to stay in Illinois. With the assistance of Jim McCarthy, assistant director of governmental affairs for the National Federation of the Blind, April Davis requested a fair hearing. The amendment to the Rehabilitation Act granting clients the right to make a free and informed choice of rehabilitation services is a part of the law because the National Federation of the Blind worked to make it a part of the law, and we intend to see that it is recognized. Before the scheduled hearing could occur, Illinois rehabilitation officials recognized our determination and changed their minds. As a result April Davis is a student at the Louisiana Center for the Blind, and she is here in Louisville attending her first convention. In the 2000 Presidential Report I indicated that Norwegian Cruise Lines had been discriminating against the blind. It required blind travelers to waive the right to claim damages in case of injury, demanded a note from a doctor stating that blind passengers are fit to travel, directed blind passengers to purchase liability insurance to cover the allegedly greater risk involved in travel for the blind, and insisted that blind passengers permit nondisabled people to travel with them in their cabins. Robert and Joy Stigile, two newly married blind people, had applied to Norwegian Cruise Lines for their honeymoon trip. Imagine their reaction to the requirement that a sighted person be designated to share their cabin on the cruise. The Stigiles were not alone in the discrimination they faced. Steve Gomes had also sought passage on one of Norwegian's ships but had been sent home because of his blindness. Norwegian officials said that it would be too dangerous for a blind person to travel alone on shipboard. We assisted with a discrimination case, which has now come to a conclusion. A court decree filed in the United States District Court for the Southern District of Florida declares that Norwegian Cruise Lines is ordered to treat blind passengers in the same manner that it treats sighted passengers; it is required to have its personnel undergo training about blindness and disability; and it must pay a civil penalty of $22,500 to the government and compensation to Robert and Joy Stigile and Steve Gomes of $42,500. This is one more reason to be a part of the National Federation of the Blind. When Fred Schroeder, former commissioner of the Rehabilitation Services Administration, learned that a position to direct the Hadley School for the Blind was available, he applied. Despite his extraordinary credentials, he was not even offered an interview. Dr. Schroeder filed suit alleging that he had been the victim of discrimination on the basis of his blindness. Without admitting any wrongdoing, the Hadley School for the Blind agreed to make a donation to the National Federation of the Blind National Organization of Parents of Blind Children in exchange for dismissal of the suit. The amount of the contribution is $20,000. The State of Arkansas put in a brand new statewide computer system to be used by all state employees. The contractor selling the system, SAP, ignored its legal requirement to make the system accessible, and the State of Arkansas did not protest. On behalf of Donna Hartzell and Larry Wayland, both blind employees of Arkansas state government, we filed a complaint against the State of Arkansas. After some preliminary skirmishing, the State of Arkansas sued SAP and is withholding payment. Whether it was the money they didn't get or the lawsuit papers they did, SAP is now interested in accessibility, and we intend to help them get more interested. Some time ago Robert Vick, a blind vendor living in New Mexico, sought, with the help of the New Mexico Commission for the Blind, to become the operator of food service programs at Kirtland Air Force Base. Last year we persuaded the air force to recognize the priority of blind vendors on federal property, but NISH, formerly National Industries for the Severely Handicapped, filed suit against the air force. Their purpose was to prevent any vendor (in this case Robert Vick) from operating food service at Kirtland Air Force Base. We intervened on behalf of Robert Vick and the New Mexico Commission for the Blind. On January 30, 2002, the Federal District Court agreed with us in the case of NISH v. Rumsfeld that the Randolph-Sheppard priority applies to the contract to operate the cafeteria at Kirtland Air Force Base in Albuquerque, New Mexico. Robert Vick began operating the cafeteria on February 1, 2002. NISH has appealed the New Mexico trial court's decision, but we anticipate winning in the tenth circuit later this year. Mary Blanch is a blind grandmother in Dothan, Alabama, who had been given custody of her grandsons. One day, while she was preparing their lunch and they were out at the swing set in the yard, they decided to go to the store a mile away. By the time they were found, Alabama Family Services had been notified. Family Services decided that Mary Blanch was not fit to have custody of her own grandchildren because of her blindness. A local judge agreed, saying that he did not even need to hear evidence, because after all "Ms. Blanch is blind." The National Federation of the Blind responded to Mary Blanch's call for help. When the next hearing date came, there were blind parents from Alabama, Baltimore, and Georgia in the courtroom to testify. The judge got an education, and he told Family Services it should never have put the children in foster care. Mary Blanch has her grandchildren once more. The family has been reunited because of the efforts of blind parents in the National Federation of the Blind. We have continued to gain recognition for the work that we do and the philosophy we espouse. Last year we created the Braille Is Beautiful program to provide sighted students and teachers with an understanding of the communication method used by the blind and a comprehension of blindness itself. The National Education Association published a story this spring in its news magazine circulated to hundreds of thousands of people about the effectiveness and importance of Braille Is Beautiful. The Girl Scouts of America adopted a Braille project after reviewing Braille Is Beautiful and with our assistance distributed slates and styluses and information about the Braille Is Beautiful program and the National Federation of the Blind to two thousand scouts across the United States. An academic conference of educators was held at the National Center for the Blind last December, planned and led by Dr. Ron Ferguson, whose work has made him one of the foremost educators dealing with blindness in the United States. The University of North Dakota has adopted our book, Handbook for Itinerant and Resource Teachers of Blind and Visually Impaired Students, by Doris Willoughby and Sharon Duffy, as required course material for one of its classes. A record number of visitors have come to the National Center for the Blind in the past year, more than 2,600 of them from the United States and fourteen other countries including Australia, Belgium, Canada, England, Ecuador, Japan, Kenya, Korea, Malaysia, Thailand, Togo, United Arab Emirates, United Kingdom, and Vietnam. We continue to operate the Aids, Appliances, and Materials Center, distributing in the neighborhood of two million devices and pieces of literature to the blind of the United States and twenty-three foreign countries. In the Materials Center we handle sixty calls a day and fill over 600 orders a month. We continue to conduct training seminars at our National Center for the Blind. The Braille and Nonvisual Access Technology Training Workshops provide information to rehabilitation professionals and teachers of the blind to assist their students and clients. Then there have been the leadership seminars for Montana, Illinois, Arkansas, New Hampshire, New Jersey, and New York. In addition to these, there have been many other meetings, classes, and seminars at our National Center. Remodeling at the National Center continues. This year we have replaced the windows on the third floor, removed walls, ceilings, and fixtures left by former occupants, and installed a heat and air conditioning system. When we moved to the National Center for the Blind, we did not know what we would do with all of the space. However, most of the building is now fully occupied, and we are contemplating developing programs to use the remainder. Building the National Federation of the Blind is of prime importance. Without the strong supporting network of the Federation, individual blind people will often be without a mechanism for participation. With this in mind we are putting in place the NFB Corps, an ongoing program designed to send blind people into local communities to help build and strengthen local chapters and affiliates. The first effort of NFB Corps began at the end of May. A stalwart group of seven Federationists has been at it now for more than a month. Not everything we attempt will be successful, but we will continue with efforts to expand the program, and we will refine our techniques. We have asked for a commitment of time of not less than a month, but we need people who can work for much longer--at least a year and maybe two. Our plan is to recruit those who can stay with the program and who can help to build our organization from within. The most rapidly growing segment of the blind population is the group of senior citizens. Rehabilitation programs are designed for those of working age. The elderly are often unable to receive rehabilitation or adjustment to blindness services because they don't have a vocational goal. We have conducted seminars for blind senior citizens, and we are planning to expand this program to operate throughout the United States. What do senior citizens need? They need what the rest of us need--the knowledge that blind people of any age can compete, information about the techniques for doing things without sight, a support system to encourage them in gaining opportunity to use their God-given talents, and access to the tools that will help bring effectiveness to their lives. This is what we will offer in the Senior Enrichment Program of the National Federation of the Blind. We have continued to distribute the Braille Monitor, the largest-circulation general information magazine about blindness in the nation; Future Reflections, the magazine for parents and educators of blind children; and Voice of the Diabetic, our magazine addressing the problems of blindness and diabetes. With a circulation of over three hundred thousand per quarter, Voice of the Diabetic is probably the most widely distributed periodical dealing with blindness. Since our last convention we have published two new Kernel Books--Safari, which was released last fall, and Summit, which is being issued at this convention. With four and a half million of these books now in circulation, we are reaching an ever increasing group of staunch supporters of the programs of the Federation. These small volumes explain in detail what blindness is from the firsthand experiences of blind people themselves. But of equal importance, they tell of the hope and faith that we have in ourselves and in our blind brothers and sisters. We have continued to support Braille literacy for blind students and adults. We published The Slate Book, by Jennifer Dunnam, to encourage learning to write Braille with a slate, and we produce more Braille than anybody else in the United States except the Library of Congress. We have continued the Braille Readers Are Leaders Contest, and we offer assistance in distributing Braille books to school-age children without charge. As I have worked with you (the members of the National Federation of the Blind) during the past year, I have felt much satisfaction in the accomplishments we have been able to achieve. Along with you I have felt frustration when we have discovered roadblocks and impediments to our progress. Nevertheless, despite the roadblocks and the impediments, I come to this convention with boundless hope and enthusiasm. I have come to know the hearts of members of the Federation, and from this knowledge I can feel nothing but optimism. We have pledged ourselves to a cause--one that is worth our energy and commitment--one that inspires and challenges. In the Federation we have a bond of caring and commitment from me to you and from you to me. Much of what we do is not simple or easy--some of it is hard. Furthermore, the challenges that face us often demand more than we thought we had to give--more than we thought we could do. But we always find the resources, the imagination, and the self-belief. We never give up. As I think about the year just past and as I contemplate the future, I know that what we have done is only the beginning. When we face the challenges that will come, we must stand together; we must be indivisible; we must remain unshakable. For my part, I will not hesitate to act when I believe it is necessary. I will stand in the front lines, and I will take whatever comes. I will not waffle or attempt to avoid the difficult choices. And I will never lose my faith in what we can do and in what we are. You must also do your part. You must be prepared to support me and each other. You must stand with me in the battle line, you must maintain your faith, and you must care for me and for your fellow Federationists as I must care for you. I have been president of this organization for sixteen years. It has been among the most challenging and joyful assignments any human being could be offered. I am prepared to continue to serve as long as you want me to do so, and I will not permit anything to prevent me from giving to the task all of the energy and imagination and dedication I possess. This is my obligation; this is my pledge; this is my report. Life insurance constitutes a very special gift to the National Federation of the Blind. A relatively easy and direct form of planned giving is a new life insurance policy. You can make the NFB the beneficiary and owner of a life insurance policy and receive a tax deduction on the premium you pay. For example, at age fifty you purchase a $10,000 whole life insurance policy on yourself and designate the NFB as beneficiary and owner of the policy. The premium cost to you is fully tax-deductible each year. You may even decide to pay for the entire policy over a specific period of time, perhaps ten years. This increases your tax deduction each year over the ten-year period and fully pays up your policy. You may, however, already have a life insurance policy in existence and wish to contribute it to the NFB. By changing the beneficiary and owner to the National Federation of the Blind, you can receive tax savings, depending on the cash value of the policy. Your attorney, insurance agent, or the National Federation of the Blind will be able to assist you if you decide to include the NFB in your planned-giving program through life insurance. For more information contact the National Federation of the Blind, Special Gifts, 1800 Johnson Street, Baltimore, Maryland 21230-4998, phone (410) 659-9314, fax (410) 685-5653.